Just now, I was looking for some crossword puzzles to do. It has been a long time since I played any crossword puzzles but since today is a lazy, rainy Sunday and I did not have much work on my desk, I decided to seek out some crosswords to play with. We no longer order any newspapers so I thought that I could find some on the web. Find them I did! 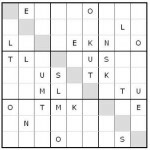 OnlineCrosswords.net is offering free daily printable crossword puzzles that avid crossword players can print out and play at their own leisure. Today, they have seven free printable crossword puzzles. I think they offer SEVEN daily. I may be wrong with the number, though. I think that crossword puzzles are wholesome family activity that everyone could participate in. Are you looking for something to do this Sunday evening? Print out these crossword puzzles! This entry was posted in Printables and tagged crossword, crossword puzzle, crossword puzzles, crosswords, free crossword puzzle, free crossword puzzles, free printable crossword puzzle, free printable crossword puzzles, printable crossword puzzle, printable crossword puzzles on June 29, 2008 by Cyberpartygal.